Marvel Comics, Becomes Official in the 1960s! Marvel Comics, now under its official banner, was setting out to revolutionize comic superheroes. With DC Comics’ success at reviving superheroes through the 1950s and early 1960s, Marvel decided to jump back on that bandwagon. Now editor and still writer, Stan Lee and freelance artist Jack Kirby set out at creating or reviving new characters that are a mainstay with the comic book industry today. They created such memorable superheroes as The Fantastic Four, Hulk, Spider-Man, the X-Men and Daredevil. Other notables were The Mighty Thor, Ant-Man and Iron Man. Through these stories, sprung up some of the greatest bad guys of all time. There were Doctor Doom, Magneto, Galactus, the Green Goblin and Doctor Octopus (Doc Ock). The most successful new series was The Amazing Spider-Man, by Stan Lee and Steve Ditko. And look at how successful and popular Spider-Man has remained over the years. He still reigns as one of my favorite characters. Marvel Comics became noted for focusing on character flaws and frailties to a greater extent than most superheroes before them. This was true of Spider-Man, in particular. Its young hero suffered from self-doubt and mundane problems like any other teenager. Marvel superheroes were often flawed, freaks, and misfits, unlike the perfect, handsome, athletic heroes found in previous traditional comic books. Some of the Marvel heroes looked like villains and monsters. In time, this non-traditional approach would revolutionize comic books. "DC was the equivalent of the big Hollywood studios: After the brilliance of DC's reinvention of the superhero ... in the late 1950s and early 1960s, it had run into a creative drought by the decade's end. There was a new audience for comics now, and it wasn't just the little kids that traditionally had read the books. The Marvel of the 1960s was in its own way the counterpart of the French New Wave.... Marvel was pioneering new methods of comics’ storytelling and characterization, addressing more serious themes, and in the process keeping and attracting readers in their teens and beyond. Moreover, among this new generation of readers were people who wanted to write or draw comics themselves, within the new style that Marvel had pioneered, and push the creative envelope still further." Stan Lee , whom now, is synonymous with Marvel Comics and characters, became one of the best known names in the comics industry. With his charming personality and never ending promotion of the company, Stan’s “voice” or persona was what others sensed in the Marvel characters of the first half of the sixties. It later became clear though, that creative artists like Jack Kirby and Steve Ditko had as much to do with superhero success as Stan did. Lee, however, continues to deserve great credit for his well-honed skills at dialog and story sense. And also for his keen hand at choosing and motivating artists and assembling creative teams and for his uncanny ability to connect with the readers. In 1971, the United States Department of Health, Education, and Welfare approached Stan to do a comic book story about drug abuse. Lee agreed and wrote a three-part Spider-Man story portraying drug use as dangerous and unglamorous. However, the industry's self-censorship board, the Comics Code Authority, refused to approve the story because of the presence of narcotics, deeming the context of the story irrelevant. 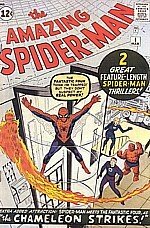 Lee, with Goodman's approval, published the story regardless in The Amazing Spider-Man #96-98 (May-July 1971), without CCA approval. The story line was well received and the CCA's argument for denying its approval was criticized as counterproductive. The Code was subsequently revised the same year. Goodman retired as publisher in 1972 and was succeeded by Lee, who stepped aside from running day-to-day operations at Marvel Comics. A series of new editors-in-chief oversaw the company during another slow time for the industry. Once again, Marvel attempted to diversify, and with the updating of the Comics Code achieved moderate success with titles themed to horror (Tomb of Dracula), martial arts, (Shang-Chi: Master of Kung Fu), sword-and-sorcery (Conan the Barbarian, Red Sonja), satire (Howard the Duck) and science fiction ("Killraven" in Amazing Adventures). Marvel was able to capitalize on its successful superhero comics of the previous decade by acquiring a new newsstand distributor and greatly expanding its comics line. Even more importantly, during a time when the price and format of the standard newsstand comic were in flux, Marvel captured a significant piece of DC's market share by offering a lower-priced product with a higher distributor discount. In the mid-1970s, Marvel was affected by a decline of the newsstand distribution network. Cult hits such as Howard the Duck were the victims of the distribution problems, with some titles reporting low sales when in fact they were being resold at a later date in the first specialty comic-book stores. An attempt by Marvel to buy DC was frustrated by DC's refusal to sell its entire library of characters (wanting to retain control of Superman and Batman), and DC was sold to Warner Communications instead. By the end of the decade, Marvel's fortunes were reviving. In part, this was due to the rise of direct-market distribution (selling through those same comics-specialty stores instead of newsstands). Another income boost was attributed to the increase in sales of previously borderline books. The previously canceled 1960s title The Uncanny X-Men, was revived to become a hit series under the team of writer Chris Claremont and artist John Byrne. Another help was the more naturalistic, urban-crime superhero comic Daredevil, by writer/artist Frank Miller. To continue the Marvel Comics saga, scroll down to the bottom of the page and click on through. To see what Marvel is up to today, you can visit their official site at Marvel Comics . There also looks to be quite a varied assortment of all things Marvel at Amazon that may tickle your taste buds. Just click the image to the left. Don’t stay too long though, and come back here. I have more interesting factoids on my next page. If you want to keep up on the varied and interesting activities going on in the world of comic books, then feel free to sign up for my newsletter “Comics Galore” in the form below. And by all means, I would love to hear your comments and opinions on Marvel Comics. You can sure leave them for me at my contact page in the menu at the left. I may even be able to include them in my newsletter. I thank you ahead of time. One click away from Marvel Comics, the 1980s to the present.